Midtempo latin' flavoured R&B rocker! Art Neville, born Arthur Lanon Neville in New Orleans on Dec. 17, 1937, has a career spanning all the phases of New Orleans music-mambo, rock'n'roll, soul and modern funk. Heavily influenced by Professor Longhair, Neville joined the Hawketts — Carol Joseph (trombone), August Fleury and Israel Bell (trumpets), George Davis (alto), Maurice Bashman (tenor), Alfred August (guitar) and John Bou-dreaux (drums) — in 1955. Their record of 'Mardi Gras Mambo', with Neville on piano and vocals, is released annu-ally by Chess to coincide with the local celebrations. Neville went solo on Specialty in 1958 with several rocking singles, all made with the assistance of Cosimo Matassa's finest stu-dio sessionmen. Jerry Byrne's 'Lights Out', also on Spe-cialty, features Neville's brain-bending piano solo. In 1961, Neville followed his brother Aaron to Minit where he re-corded under Allen Toussaint. Later he formed the Meters. 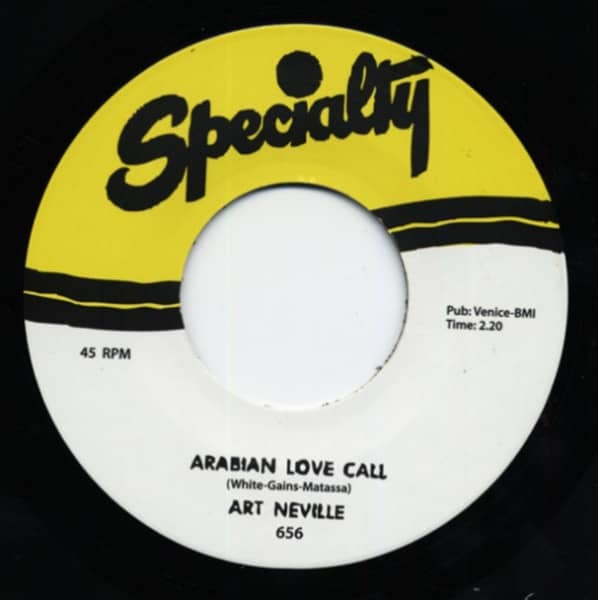 Customer evaluation for "Arabian Love Call - What's Going On 7inch, 45rpm"